“The broad range, depth and quality of fintechs on this map shows just how far Australia’s fintech environment has come in less than two years. 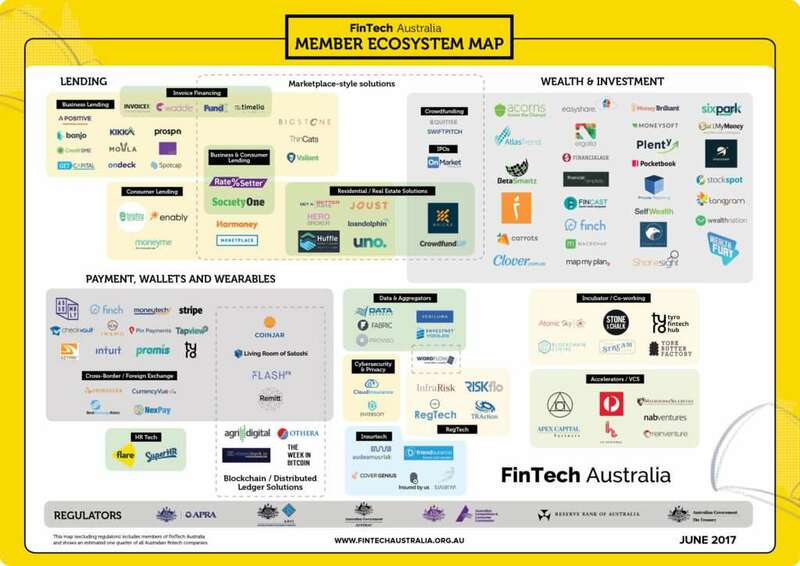 The ecosystem map shows that wealth and investment, and consumer and business lending, are Australia’s two largest fintech sub-sectors – an outcome that is consistent with findings from last year’s EY FinTech Australia Census. The strong focus on wealth and investment to some extent reflects the fact that, in 2016, Australia had Asia’s largest pool of funds under management – and the 6th largest in the world. In addition, Australia’s US$1.6 trillion largest superannuation (also known as pension) market is the fourth largest in the world. Ms Szetho said fintechs operating in the consumer-facing wealth and investment space have already made major penetrations into the Australian market. For instance, budgeting fintech Pocketbook already has more than 300,000 users, while micro-savings fintech Acorns has well over 200,000 users. “Many of our fintechs in the wealth and investment area are run by highly experienced financial service executives, who have left large corporate institutions to begin their own innovative startup companies that are unencumbered by large legacy systems,” Ms Szetho said. In addition, the map shows that Australia’s fintech lenders are rapidly filling market gaps in both consumer and business lending. For instance, in regard to business lending, a recent survey found that one in five small-to- medium enterprises are now planning to use non-bank financing, compared to just one in ten in 2014. “Our business lenders are typically using in-house or third party technology to analyse the financial information of small businesses, so they can then offer the best and fastest possible deals,” Ms Szetho said. Other strong areas of Australia’s lending space include invoice financing, peer-to-peer personal loans and also home loan marketplaces that are empowering consumers to get a better mortgage deal on their most valuable assets. Ms Szetho said the map also showed the many other growing areas of the Australian fintech ecosystem, including payments, wallets and wearables, blockchain/distributed ledger, regtech, insurtech, data aggregators and cybersecurity. The map also takes a unique approach to laying out the fintech ecosystem by seeking to show where there are overlaps between different sub-sectors. For instance, the map shows lending and wealth and investment products that rely on marketplace style solutions and payments, along with wallets, payments and wearables companies which rely on distributed ledger solutions. FinTech Australia plans to update the map at least once every six months.